The craze for defeating the demons and the process of doing so can never get old. The bloodshed, the thirst of killing, and the thrill are what you will find in the Thunderkick’s Bork the Berzerker Hack “n” Slash Edition slot game. This particular version of the game is a refurbish of the original which is not available for playing anymore as it has been discontinued now. The game is compatible with all the commonly used devices for playing. The game has a total of 5 reels to play in and no less than 20 paylines. It is based on a dramatic theme of a Norse Legend which makes it all the way more interesting. The game has an extremely high RTP equivalent to 97.34%. This impressive return-to-player rate is because of its different theme and of course the attractive ways to win. It has bonuses and other attractive features to compel a player to come back and play again. Talking about the maximum and the minimum bets, it is as low as 0.10 and as high as 100.00 in a single spin. The maximum win of the game can give you returns worth 2,100 times the amount of your stake. Isn’t that the most impressive thing that you’ve heard in the day? The theme of the game, as mentioned above, is based upon the creepy Norse Legend. Adhering to that, the game’s backdrop that is clearly visible behind the reels is a wall with a lot of blood splashes on it which might freak you out a bit. On the bottom of the screen is a lit fire which adds more to the entire drama of the game’s theme and outlook. If you are a light-hearted person, the game is surely not for you. The game has 5 high paying symbols and 3 low paying symbols. The high paying ones include the various colored monsters. These colors include blue, red, brown, green and purple. The symbols also include the Yetis, Snakes, Sorcerers, Sea Maidens, and Mermen. Bork himself can also be spotted on the screens. The symbol that holds the highest value is the sea maiden. The low-value symbols are three Norse letters basically or the runes. The special symbols involved in the game are represented by the Bork himself and a monster which is purple in color. These two special features are the ones responsible for triggering the bonus features. The game offers some really interesting bonuses which help it in maintaining the jaw-dropping RTP of the game. It not just keeps in the player’s interest into the game, but also makes him/her spread around a good word about it hence attracting more and more new players. The Wild: The game offers an expanding wild to its players. This particular feature is what you’ll frequently witness in the game. It brings in more and more violent animations to your screen making it dark and intense. In the basic game, the Bork’s symbol pops up only in the third reel of the game. Every single time when it appears there, in case a winning combination is forming, it expands and covers the entire reel to allow the win to happen. A short clip might be available for you to see on this event where Bork can be observed chopping down the enemies brutally. The major wins, on the other hand, can be grabbed if you are lucky enough to land up more than a single wild symbol in one spin. Total 3 scatters will give you 10 free spins. Total 4 scatters will give you 20 free spins. You can win more of the free spins if more scatter symbols pop in but it cannot exceed 20. Also, another notable point is that Bork can appear on the middle three reels when the free spins are in action. 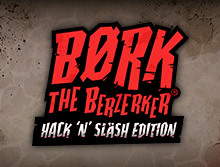 Bork the Berzerker Hack ‘n’ Slash Edition is an interesting game to play. It is a dark and creepy game which has some interesting bonuses to offer. The theme is extremely different and unusual and adds to its popularity. It has an outstanding outlook and a depressingly scary soundtrack to increase the intensity of the game. Overall, it is surely a must play slot game.